I was following the tutorial to make a production ready ionic app. I wanted to uglify my js. All works great except for 'ionic build android' generates an apk, installing which the app doesn't run. The same code runs with 'ionic serve --lab' and 'ionic run android'. Please help. I added the following code for exception handling, is there a better way to know what run-time exception might cause something like this? I followed that tutorial but at some point I gave up as it was mixing too many different different tasks: gulp and node. My personal opinion is the hooks should be responsible to prepare the folders for the final build. I came up with this solution which works pretty well but requires some configuration. Having said that even the solution proposed in that article requires some sort of defining folders for different gulp tasks. before_prepare\02_jshint.js must be copied in the folder before_prepare inside hooks. If you don't have that folder, just create it. after_prepare\011_move_fonts_to_root.js must be copied in the folder after_prepare. after_prepare\012_concat_files_in_index.js must be copied in the folder after_prepare. after_prepare\013_unused_folders_delete.js must be copied in the folder after_prepare. after_prepare\014_uglify.js must be copied in the folder after_prepare. after_prepare\015_prepare_index_html.js must be copied in the folder after_prepare. I'll try to explain what all these scripts should do. I am doing this as I don't have all main application's js files in the same place. 011_move_fonts_to_root.js move all the fonts in a folder called fonts in the root of your app. I have to do this task as at some point I am going to remove all the lib folder, which is a hell of a lot of weight for your app during release. where you can add other fonts folders you want to move to the root fonts. 012_concat_files_in_index.js parses the html file index.html and finds all the references to the js and css files and concatenate all those files in just 2 documents: app.js and app.css. These 2 bundles will contain all the js files of your app included the ionic bundles. NOTE: cordova.js won't be touched cause it's better like this. appConcatFolder is the folder which will contain the bundle for the js file. appConcatFile is the name of the js bundle. cssConcatFolder is the folder which will contain the bundle for the js file cssConcatFile is the name of the css bundle. 013_unused_folders_delete.js will delete all the unused folders. Since we're moving stuff around there no need to have those folders copied in our final app. 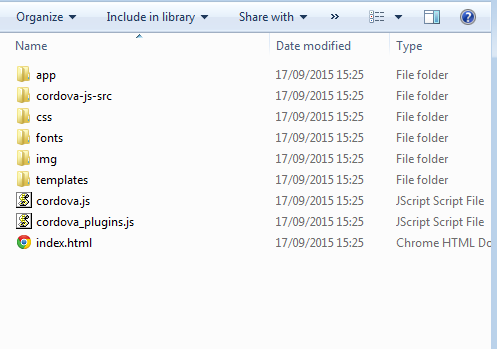 Since we've moved all the js files in the folder app (in the root) we don't need the js folder any more. We get rid of the lib folder where all the ionic stuff as been put. 014_uglify.js uglifies and minifies the js file and the css bundles. This array contains the folders where the css bundle; the other folder is the js bundle folder. 015_prepare_index_html.js will use node-useref to parse our index.html file and replace the scripts and css with our bundles. if you want to find out more about node-useref you can check here. or my custom ionic run --runrelease. You will see lot of things happening as I write in the console quite a lot of info. where you will find your compressed, minified and uglified files and your index.html with the new references. python manage.py runserver works fine the first time, but after closing it with ctrl+c, I can't start it up again. I get the error message "Python has stopped working". This is easily fixed by restarting my computer but it is very inconvenient.